Increased apoptotic death of gastric epithelial cells is a hallmark of Helicobacter pylori infection, and altered epithelial cell turnover is an important contributor to gastric carcinogenesis. To address the fate of apoptotic gastric epithelial cells and their role in H. pylori mucosal disease, we investigated phagocyte clearance of apoptotic gastric epithelial cells in H. pylori infection. Human gastric mononuclear phagocytes were analyzed for their ability to take up apoptotic epithelial cells (AECs) in vivo using immunofluorescence analysis. We then used primary human gastric epithelial cells induced to undergo apoptosis by exposure to live H. pylori to study apoptotic cell uptake by autologous monocyte-derived macrophages. We show that HLA-DR+ mononuclear phagocytes in human gastric mucosa contain cytokeratin-positive and TUNEL-positive AEC material, indicating that gastric phagocytes are involved in AEC clearance. We further show that H. pylori both increased apoptosis in primary gastric epithelial cells and decreased phagocytosis of the AECs by autologous monocyte-derived macrophages. Reduced macrophage clearance of apoptotic cells was mediated in part by H. pylori–induced macrophage TNF-α, which was expressed at higher levels in H. pylori–infected, compared with uninfected, gastric mucosa. Importantly, we show that H. pylori–infected gastric mucosa contained significantly higher numbers of AECs and higher levels of nonphagocytosed TUNEL-positive apoptotic material, consistent with a defect in apoptotic cell clearance. Thus, as shown in other autoimmune and chronic inflammatory diseases, insufficient phagocyte clearance may contribute to the chronic and self-perpetuating inflammation in human H. pylori infection. Increased apoptosis of gastric epithelial cells is a hallmark of human Helicobacter pylori gastritis (1). Multiple pathways and bacterial virulence factors that cause H. pylori–induced apoptosis have been identified, including enhanced production of reactive oxygen species (2), upregulation of Fas receptor (3), disruption of mitochondrial membranes by H. pylori VacA (4, 5), and cross-linking of MHC class II molecules by H. pylori urease (6). Enhanced apoptosis during prolonged H. pylori infection provides a persistent stimulus for epithelial cell proliferation, a key process in the cascade of carcinogenic events that promote gastric cancer (1, 7). Microbe-stimulated apoptosis also may cause the induction of Th17 cells (8), crucial cellular contributors to gastric pathology in H. pylori infection (9). However, despite the contribution of H. pylori–induced epithelial cell apoptosis to gastric inflammation and carcinogenesis, the fate of apoptotic epithelial cells (AECs) in inflamed gastric mucosa is not known. Macrophage and dendritic cell (DC) removal of dying and dead cells prevents the release of proinflammatory signals (10) and is a prerequisite for the maintenance of tissue homeostasis (11). Impaired removal of apoptotic cells allows the dying cell to progress to secondary necrosis, resulting in the loss of membrane integrity and the release of intracellular proinflammatory molecules and autoantigens (12). Defective removal of apoptotic cells has been linked to autoimmune syndromes and chronic inflammatory diseases such as systemic lupus erythematosus (SLE) (13). However, in the gastrointestinal tract, apoptotic cell removal occurs not only by phagocytic uptake (14, 15) but also by luminal extrusion independent of phagocyte activity (16) or a combination of both (17). Also, the mechanisms of AEC elimination differ between species and between individual regions of the gastrointestinal tract (15, 18). Notably, AEC removal in the human gastric mucosa has received little investigative attention. We previously isolated and characterized HLA-DR+/CD11c+/− mononuclear phagocytes (MNPs) from human gastric mucosa and showed that these cells take up H. pylori bacteria and promote Th1 responses to H. pylori (19, 20). In this study, we show that normal human gastric MNPs also are involved in the clearance of gastric epithelial cells that have undergone apoptosis. However, prior exposure of phagocytes to H. pylori impairs the cells’ ability, in a TNF-α–dependent manner, to subsequently phagocytose H. pylori–treated AECs, resulting in an accumulation of nonphagocytosed apoptotic material in the gastric lamina propria of H. pylori–infected individuals. Thus, H. pylori upregulates programmed cell death of gastric epithelial cells and downregulates programmed cell removal of AECs by macrophages, features that may provide a potent source of autoimmune stimulatory activity in chronic H. pylori infection. Gastric tissue specimens for cell isolation and histological analyses were obtained with Institutional Review Board approval and informed consent from adult subjects at the University of Alabama at Birmingham undergoing elective gastric bypass for obesity or diagnostic esophagogastroduodenoscopy. Absence of active and past H. pylori infection was determined by negative serological analysis and/or rapid urease CLO test (Kimberly-Clark, Roswell, GA). Heparinized blood samples were obtained from the same patients. Biopsy specimens for quantitative real-time PCR analysis and tissue microarrays for TUNEL analysis were obtained with Institutional Review Board approval from adult subjects with abdominal symptoms residing in Santiago, Chile (Supplemental Table I). Exclusion criteria included: 1) use of antibiotics, antacid, H2-blocker, proton-pump inhibitor, bismuth compound, nonsteroidal anti-inflammatory drug, or immunosuppressive agent during the 2 wk prior to endoscopy; and 2) stool examination positive for OVA or parasites. H. pylori status was determined by rapid urease test and microscopic evaluation, and a study subject was judged colonized with H. pylori if one or both tests were positive for the bacteria. Cultures of primary human gastric epithelial cells were prepared as previously described by Smoot et al. (21). Briefly, 10–20 gastric biopsies or 1 g gastric mucosa obtained from gastric bypass donors were minced with a scalpel blade and digested for 1 h at 37°C, 200 rpm, with a digestion solution containing RPMI 1640, collagenase (0.5 FALGPA units/ml; Sigma-Aldrich, St. Louis, MO), dispase (1.25 U/ml; Roche, Mannheim, Germany), DNAse (0.2 mg/ml; Sigma-Aldrich), and BSA (0.3%; Fisher, Fair Lawn, NJ). Recovered cells were suspended in F12K medium containing 10% FBS, amphotericin (125 ng/ml), penicillin (100 U/ml), streptomycin (100 μg/ml), and gentamicin (50 μg/ml) and plated on collagen-I–coated plates (Biocoat; BD Biosciences, San Jose, CA). Nonadherent cells were removed after 18 h of culture. Phenotypic analysis of gastric epithelial cells was performed using anti–ZO-1 (clone 1), anti-cytokeratin (CAM5.2, specific for mucosal epithelial cell associated Moll’s peptides #7 and #8), anti-human CD104 (439-9B), anti-human CD90 (5E10), anti-human CD45 (2D1), and anti-human HLA-DR (L243) (all from BD Biosciences), BerEp4 (DakoCytomation, Carpinteria, CA), and Alexa 488-phalloidin (Molecular Probes, Eugene, OR). Human gastric lamina propria cells were isolated as previously described (19). Briefly, gastric mucosa was treated with HBSS containing EDTA (1.25 mM) plus DTT (0.2 mg/ml) (3 × 30 min) to remove surface epithelial cells and then digested using collagenase solution (0.5 FALGPA units/ml, 3 × 45 min). Dead cells and particles were removed by 30 min sedimentation on ice followed by filtration through 40-μm cell strainers. Monocyte-derived macrophages were differentiated from MACS-isolated CD14+ blood monocytes by culturing 1 × 106 monocytes/well for 3 to 4 d in 24-well plates in complete medium (RPMI 1640, 10% heat-inactivated human AB serum and antibiotics) supplemented with recombinant human (rh)M-CSF (10 ng/ml; R&D Systems, Minneapolis, MN). H. pylori strain 60190 (cagA+, vacA s1/m1) was a kind gift from Dr. G. Perez-Perez (New York University); GFP-labeled H. pylori strain M6 was a kind gift from Dr. John Y. Kao (University of Michigan, Ann Arbor, MI). Bacteria were grown at 36°C under semianaerobic conditions on Brucella agar plates, 5% horse blood (BD Biosciences), for 3 d. Colonies were harvested into warm Brucella broth, and bacterial numbers were determined by spectrophotometry at 600 nm based on a standard curve generated using the LIVE/DEAD BacLight Bacterial Viability and Counting Kit (Molecular Probes). Titration experiments with H. pylori revealed 2 × 107 bacteria/ml (a multiplicity of infection [MOI] ≈35) as the optimal concentration to induce primary epithelial cell apoptosis, an MOI of 10 was optimal for suppression of macrophage phagocytosis, and an MOI of 50 was optimal for the detection of phagocytosed GFP–H. pylori in monocyte-derived macrophages. Apoptosis of primary epithelial cells was induced by 6–8 h treatment with fresh H. pylori (2 × 107 bacteria/ml) or camptothecin (CMP; 5 μM; Sigma-Aldrich). Apoptosis was determined by Annexin-V FITC binding (Southern Biotechnologies, Birmingham, AL), and necrosis was determined by propidium iodide (PI) uptake and LysotrackerRed labeling (both from Invitrogen). Cells were analyzed using an LSRII flow cytometer (BD Biosciences) and FlowJo 7.5.5. software (Tree Star, Ashland, OR). MNPs in cytospins of gastric lamina propria cells or cryosections prepared from healthy gastric tissue were labeled with anti–HLA-DR–PE or –Cy3. Apoptotic DNA was detected by the TUNEL using the Fluorescein In situ Cell Death Detection kit (Roche, Mannheim, Germany), and epithelial material was detected with an anti–cytokeratin-FITC Ab (CAM5.2; BD Biosciences). For immunofluorescence labeling, slides were fixed in ice cold acetone, washed in PBS/0.05% Tween-20, blocked (Dako Protein Block; DakoCytomation) and then incubated with the appropriate Abs. For quantitative analysis of apoptotic cell uptake in gastric mucosa, formalin-fixed, paraffin-embedded tissue from nine H. pylori–infected and seven healthy adults organized on a single slide as a tissue microarray (22) was treated with proteinase K (20 μg/ml; Millipore, Billerica, MA) for 20 min at room temperature, subjected to Ag retrieval with Dako Target Retrieval Solution (DakoCytomation) at 98°C for 20 min, labeled for apoptotic material using the ApopTag Plus Kit (Millipore) together with an anti Digoxigenin-FITC Fab fragments (Roche), and then labeled for MNPs using anti–HLA-DR (LN-3; Abcam, Cambridge, MA) and a goat anti-mouse-Cy3 secondary Ab (Jackson ImmunoResearch Laboratories, West Grove, PA). In all experiments, cell nuclei were stained with DAPI. Samples were analyzed on a Nikon Eclipse T2000-U fluorescent microscope (Nikon) equipped with a CoolSnap ES digital camera (Roper Scientific, Martinsried, Germany) and NIS Elements BR2.30 (Nikon). HLA-DR+ cells, TUNEL+ particles, and DAPI+ cell nuclei were counted using the taxonomy feature of the software, with the investigator blinded to the identity of the samples. Gastric epithelial cells treated with H. pylori or CMP to induce apoptosis, as described above, were labeled with CellTracker Green CMFDA (2 μg/ml; Invitrogen, Eugene, OR) for 1 h at 37°C and harvested using trypsin-EDTA. Simultaneously, macrophages were labeled with CellTracker Red CMTPX (2 μg/ml; Invitrogen) for 1 h, washed, and then harvested using a cell scraper. Macrophages and epithelial cells (1 × 105 each) then were cocultured for 2.5 h at 37°C. Control cultures were maintained at 4°C. To inhibit macrophage phagocytosis, macrophages were pretreated with cytochalasin D (1 μg/ml; Sigma-Aldrich) for 45 min prior to coculture, with continuing exposure of the cells to cytochalasin D during coculture. To block binding of apoptotic cells to macrophages, epithelial cells were pretreated with recombinant RGD-thrombospondin repeat (TSR) region of the brain angiogenesis inhibitor 1 (BAI1) ectodomain (residues 202–585), prepared, and purified as described previously (23, 24) (10 μg/ml) for 15 min prior to coculture, with continuing exposure of the cells to BAI1 during coculture. Macrophage phagocytic activity also was analyzed by feeding the macrophages fluorescein-labeled latex beads (Fluoresbrite YG Microspheres; Polysciences, Warrington, PA) or GFP-labeled H. pylori (MOI 50). After culture, cells were washed, fixed in Cytofix (BD Biosciences), and analyzed on an LSRII flow cytometer (BD Biosciences). For confocal analysis, cells were imaged on an LSM 710 Laser Confocal Scanning Microscope equipped with Zen 2008 4.7.2 software (Zeiss, Thornwood, NY). To determine the influence of H. pylori on the ability of macrophages to engulf apoptotic cells, macrophages were treated with H. pylori 60190 at an MOI of 10 for 6 h prior to the phagocytosis experiment. Macrophages also were treated with cell-free supernatants from cultures of H. pylori–treated macrophages or rhTNF-α (10 ng/ml; R&D Systems). In addition, macrophages were treated with H. pylori as above plus neutralizing anti–TNF-α Ab (0.02–2 μg/ml; R&D Systems) or an isotype control Ab. The amount of TNF-α in the culture supernatants was determined by ELISA (R&D Systems). RNA was isolated from snap-frozen gastric biopsy samples using the RNeasy Minikit (Qiagen, Valencia, CA), and cDNA was generated using iScript Reverse Transcriptase (Bio-Rad, Hercules, CA). Target genes were amplified in 25 μl reactions containing TaqMan Universal PCR Master Mix and primer probe sets for TNF-α (FAM/MGB, Hs00174128_m1, ref. seq. NM_000594.2) and 18s rRNA (VIC/TAMRA, ref. seq. X03205.1) or GAPDH (VIC/TAMRA, ref. seq. NM_002046.3), all from Applied Biosystems (Foster City, CA). Real-time PCR reactions were run for 40 cycles (15 s, 95°C; 60 s, 60°C) on a Chromo4 PCR system (Bio-Rad) and analyzed with Opticon Monitor software, version 3.1. Relative expression rates were calculated using the Pfaffl method (25) with gastric tissue from a noninfected donor used as control. PCRs were performed twice with duplicate samples, once with each reference gene, and data are presented as the geometric mean of both reactions. Data were analyzed using Microsoft Excel 2003 and Analyze-it for Excel, version 1.73 (Microsoft). Results are presented as mean ± SEM. Differences between values were analyzed for statistical significance by the two-tailed Student t test, unless stated otherwise. Differences were considered significant at p < 0.05. The mechanism by which AECs are cleared in human gastric mucosa is largely unknown. In this study, we analyzed whether HLA-DR+ MNPs are involved in the removal of apoptotic gastric epithelial cells. Cytospins of gastric lamina propria mononuclear cells obtained from H. pylori–negative donors were stained for HLA-DR and, using the TUNEL method, for apoptotic DNA. Microscopic image analysis (Fig. 1A, 1B) showed that 10–15% of the gastric MNPs contained TUNEL+ inclusions in their cytoplasm, indicating the cells had taken up apoptotic material. A similar proportion of gastric MNPs contained epithelial cell–specific cytokeratin+ inclusions consistent with the epithelial origin of the apoptotic material. The TUNEL+ and cytokeratin+ inclusions were discrete and varied in size, suggesting that fragments of different sizes were ingested. Importantly, TUNEL+ and cytokeratin+ inclusions also were detected in HLA-DR+ MNPs in gastric tissue sections (Fig. 1C), confirming that AEC phagocytosis occurs in situ and is not an artifact associated with cell isolation. Thus, under steady-state conditions, apoptotic gastric epithelial cells are cleared at least in part by MNPs in human gastric mucosa. Human gastric MNPs take up AECs in vivo. (A) Cytospins of freshly isolated human gastric lamina propria cells were analyzed for the presence of fragmented DNA (TUNEL+, top panels) or epithelial cell cytokeratin (bottom panels) in the cytoplasm of HLA-DR+ MNPs. Phagocytes were labeled red with anti–HLA-DR; TUNEL+ apoptotic material and epithelial cell–specific cytokeratin were labeled green (yellow in merge). The bottom right panel shows a large green gastric epithelial cell adjacent to a phagocyte. Scale bar, 20 μm. (B) Quantitative analysis of uptake of apoptotic cells. Samples from six donors were analyzed by evaluating an average of 30 randomly selected HLA-DR+ cells for the presence of cytoplasmic apoptotic material. Data points and mean (bar) correspond to the percentage of cells that contain TUNEL+ or cytokeratin+ material. (C) HLA-DR+ (red) MNPs in tissue sections of human gastric lamina propria contain green TUNEL+ (top panels) and cytokeratin+ (bottom panels) epithelial cell–derived material (yellow in merge, arrows). Human gastric H. pylori infection is associated with increased epithelial cell apoptosis (1), and direct induction of apoptotic cell death by H. pylori bacteria has been shown in various gastric epithelial cell lines (2–6). In this study, we investigated whether primary human gastric epithelial cells undergo cell death postinfection with live H. pylori and are phagocytosed by autologous macrophages in vitro. The cultured gastric epithelial cells expressed epithelial cell–specific markers, including cytokeratin and tight junction protein ZO-1 (Supplemental Fig. 1). As shown in Fig. 2A and 2B, incubation of epithelial monolayers for 6–8 h with H. pylori (2 × 107 bacteria/ml; MOI ≈35), compared with monolayers incubated in media alone, induced a marked increase in the proportion of apoptotic (Annexin-V+/PI−) epithelial cells (56.0 ± 4.9 versus 14.7 ± 2.0%; n = 9; p < 0.001) but only a small increase in necrotic (Annexin-V+/PI+) epithelial cells (16.7 ± 3.2 versus 12.5 ± 2.1%; n = 9; p = 0.7). In addition, lysosomal membrane permeabilization, an early event of necrosis, was only detected after 24 and 48 h, but not after 6 and 12 h, of epithelial cell exposure to H. pylori (Supplemental Fig. 2A). Thus, the majority of the epithelial cells exposed to H. pylori for 6 h underwent apoptosis rather than necrotic cell death. Notably, the relatively high background in the PI channel in Fig. 2A was due to binding of bacteria to the cell surface instead of nuclear staining of membrane-permeable necrotic cells (Supplemental Fig. 2C), whereas ethanol-treated necrotic cells were present exclusively in the PI-high gate (Supplemental Fig 2D). In agreement with earlier reports (26), H. pylori induction of apoptosis in primary gastric epithelial cells was associated with expression of VacA, as VacA-deficient mutants of the 60190 strain did not induce a significant level of apoptosis (Supplemental Fig. 2D, 2E). In contrast, CagA- and urease-deficient mutants were each as capable of inducing apoptosis as the wild-type strain. Interestingly, primary gastric epithelial cells were significantly more susceptible to H. pylori–induced apoptosis than cells of the AGS gastric cell line (Supplemental Fig. 2A, 2B), and, surprisingly, CMP was less efficient than H. pylori at inducing cell death in primary gastric epithelial cells within 6 h (Fig. 2A, 2B). At 24 h, the epithelial monolayers incubated with both H. pylori and CMP, but not the control monolayer, showed prominent architectural distortion and disrupted intercellular ZO-1, consistent with epithelial cell death (Fig. 2C). H. pylori induces apoptotic cell death in primary human gastric epithelial cells (Epis). (A and B) Gastric epithelial cells were cultured for 3 d on collagen-coated plates and then treated with H. pylori (2 × 107/ml), CMP (5 μM), or medium alone. Apoptosis was determined by flow cytometric analysis of Annexin-V–FITC/PI-stained cells after 6–8 h. Representative data (A) and cumulative data (B) from 10 (untreated, H. pylori) and 5 (CMP) experiments; mean ± SEM. (C) Microscopic analysis of ZO-1–Cy3/phalloidin-FITC/DAPI-stained epithelial monolayers after 24 h exposure to H. pylori or CMP. Arrows indicate areas with altered ZO-1 immunolocalization. Original magnification ×100. Results are from a representative experiment (n = 4). We next generated monocyte-derived macrophages and labeled the macrophages with a red CellTracker dye (CMTPX). Epithelial cells obtained from matched donors were cultured with H. pylori (2 × 107 bacteria/ml) or CMP (5 μM) for 6–8 h to induce apoptosis or with media alone and then labeled with a green CellTracker dye (CMFDA). After equivalent numbers of red-labeled monocyte-derived macrophages and green-labeled H. pylori–treated AECs had been cultured for 2.5 h at 37°C, 32.5 ± 3.2% of the macrophages had acquired green fluorescence, indicating apoptotic cell phagocytosis (Fig. 3A, 3B). In contrast, flow cytometric analysis of control cultures incubated at 4°C showed only a small population of green fluorescent macrophages (7.3 ± 1.3%; n = 10; p < 0.001 for 37°C versus 4°C) after coculture, likely representing macrophages that had bound epithelial cells on their surface. A slightly lower proportion of macrophages phagocytosed CMP-treated apoptotic gastric epithelial cells (23.7 ± 5.5% at 37°C versus 6.3 ± 1.2% at 4°C; n = 10; p = 0.01), consistent with the lower rate of apoptotic cell death after this treatment (Fig. 3A, 3B). The presence of green particles inside red macrophages, indicating phagocytosed apoptotic gastric epithelial cells, was confirmed by confocal microscopy (Fig. 3A, top panels). Apoptotic gastric epithelial cells are phagocytosed by monocyte-derived macrophages through a phosphatidylserine-dependent pathway. (A and B) Gastric epithelial cell cultures were treated with H. pylori (Hp), CMP (5 μM), or with medium alone for 6–8 h to induce apoptosis and then labeled with CMFDA (green). Monocyte-derived macrophages (MΦ) were stained with CMTPX (red), and equal numbers of stained MΦ and AECs were cocultured at 4°C or 37°C for 2.5 h. (A) MΦ were analyzed by confocal microscopy (top right panels) or by flow cytometry (bottom right panels). Scale bar, 10 μm. Representative data; left panels show gating strategy. (B) Cumulative data (mean ± SEM) from 3 (untreated) or 10 (Hp, CMP) experiments. (C) To block uptake, MΦ were pretreated with cytochalasin D (CytD; 1 μg/ml) for 45 min prior to coculture with H. pylori–treated AECs (cytochalasin D also present during coculture). Representative (left panel) and cumulative data (right panel); n = 3. (D and E) Gastric epithelial cells with apoptosis induced by CMP (CMP-AEC) or H. pylori (Hp-AEC) were treated for 15 min with control GST or recombinant BAI1 RGD-TSR, which neutralizes surface phosphatidylserine, and then cultured with MΦ. (D) Representative (left panel) and cumulative data (right panel) from four experiments with 10 μg/ml of BAI1 RGD-TSR or control GST. Phagocytosis is expressed as percent MΦ that contained BAI1-treated AECs relative to GST-treated AECs (100%). (E) GST and BAI1 used at the indicated concentration, mean ± SEM of two (CMP) or three (H. pylori) experiments. SSC, Side scatter. To further investigate the mechanism of macrophage uptake of AECs, we examined the effect of cytochalasin D, an inhibitor of actin polymerization and thus engulfment, on macrophage phagocytosis of apoptotic gastric epithelial cells. Macrophages treated with cytochalasin D (1 μg/ml) before and during the incubation with H. pylori–treated gastric epithelial cells were significantly less capable of phagocytosing the epithelial cells (n = 3; p < 0.001) (Fig. 3C). Because the expression of phosphatidylserine on the outer leaflet of the plasma membrane is an essential macrophage engulfment signal (12), we assessed macrophage phagocytosis of apoptotic gastric epithelial cells after blockade of surface phosphatidylserine using the recombinant soluble fragment RGD-TSR of BAI1. BAI1 is a phospholipid receptor with a phosphatidylserine binding domain that consists of five TSR motifs (23, 24). Treatment of apoptotic gastric epithelial cells with the recombinant RGD-TSR region of BAI1 prior to coculture with the macrophages reduced, but did not completely abrogate, macrophage phagocytosis of the epithelial cells in a dose-dependent manner (Fig. 3D, 3E). A similar level of suppression was reported in our earlier study on BAI1-mediated bacterial uptake (23). Notably, higher doses of the RGD-TSR caused significant macrophage cell death, likely due to the glycerol stabilizer present in the peptide preparation. These data support previous reports of phosphatidylserine exposure as an engulfment signal molecule that mediates macrophage phagocytosis of apoptotic gastric epithelial cells. In the H. pylori–infected gastric mucosa, phagocytes likely encounter both H. pylori bacteria and AECs. H. pylori have been identified in close contact with lamina propria macrophages (27), and we have shown that human gastric macrophages contain H. pylori surface proteins (28). H. pylori inhibits its own uptake by macrophages (29), raising the possibility that macrophage interaction with H. pylori in the gastric mucosa might interfere with the uptake of AECs. Therefore, we investigated the effect of H. pylori on MNP uptake of apoptotic gastric epithelial cells in vitro. Monocyte-derived macrophages were pretreated with live H. pylori for 6 h, incubated with H. pylori–treated apoptotic gastric epithelial cells for 2.5 h, and then analyzed for engulfed epithelial cells. Exposure of the macrophages to live H. pylori caused a dose-dependent reduction in subsequent engulfment of the AECs with a 38% reduction in phagocytosis at an MOI of 10 (35.6 ± 3.5 to 22.1 ± 2.2%; n = 10; p = 0.006) (Fig. 4A–C). H. pylori stimulation inhibits macrophage phagocytic activity for apoptotic gastric epithelial cells. (A and B) Monocyte-derived macrophages (MΦ) were treated with H. pylori (Hp; MOI 10) for 6–8 h or left untreated and then stained with CMTPX (red). Gastric epithelial cells were cultured for 3 d on collagen-coated plates, treated with H. pylori (2 × 107/ml) or CMP (5 μM) for 6–8 h, and labeled with CMFDA (green). MΦ and AECs then were harvested and incubated at a ratio of 1:1 at 37°C for 2.5 h to allow MΦ engulfment of epithelial cells. Representative FACS plots (A) and individual values (diamonds) and means (bars) (B); n = 10. (C) Phagocytosis of AECs after MΦ pretreatment with different concentrations of live H. pylori; n = 3, mean ± SEM, one-way ANOVA with Tukey’s post hoc test. *p ≤ 0.05. (D and E) Soluble mediators released by H. pylori–treated MΦ inhibit AEC phagocytosis. Cell-free supernatants (SN) of MΦ cultured with or without H. pylori for 6–8 h were added to untreated MΦ for 6 h prior to the phagocytosis experiment. Representative FACS plots (D) and individual values (diamonds) and means (bars) (E); n = 6. (F and G) H. pylori–induced inhibition of MΦ phagocytosis is not specific to the uptake of AECs. MΦ were pretreated with either H. pylori, culture SN from H. pylori–treated MΦ, or media and then assayed for phagocytosis of Hp-AEC, CMP-AEC, GFP-labeled H. pylori (MOI 50), or YG fluorescent latex beads (40 beads/cell). (F) The relative efficiency of H. pylori–treated MΦ was determined by comparing the phagocytosis of treated MΦ to that of untreated MΦ for the different targets; mean ± SEM, n = 4. (G) Representative FACS plots for the data shown in (F). We next investigated whether the reduced macrophage phagocytosis caused by H. pylori was a direct effect of the bacteria or due to a soluble mediator released from the macrophages in response to H. pylori. Monocyte-derived macrophages were cultured with H. pylori for 6 h, the cell- and bacteria-free supernatants were harvested and added to fresh macrophages for 6 h, and the cells’ phagocytic activity for apoptotic gastric epithelial cells was analyzed as above. As shown in Fig. 4D and 4E, culture supernatants from H. pylori–treated macrophages (compared with supernatants from macrophages incubated in media alone) significantly suppressed the mean level of macrophage engulfment of the epithelial cells by 35% (from 45.0 ± 5.4 to 28.3 ± 3.0%; n = 6; p = 0.03). Culture supernatants from the same concentrations of live H. pylori alone did not impair macrophage phagocytosis (data not shown). 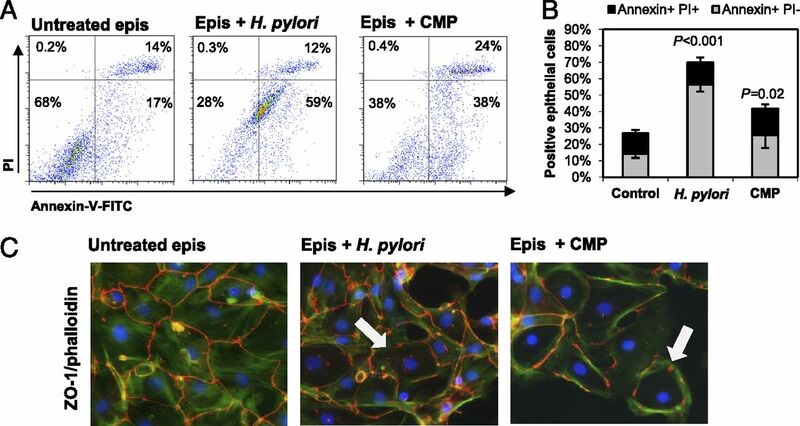 These findings implicate a soluble mediator released by the H. pylori–treated macrophages in the reduced phagocytosis of apoptotic gastric epithelial cells. Both H. pylori and culture supernatants from H. pylori–treated macrophages also suppressed macrophage phagocytosis of CMP-treated apoptotic gastric epithelial cells, GFP-labeled H. pylori, and YG-labeled latex beads (Fig 4F, 4G). Thus, both H. pylori bacteria and an H. pylori–inducible mediator reduced macrophage clearance of AECs, as well as clearance of bacteria and foreign material, suggesting a global reduction in macrophage phagocytic activity that could contribute to the accumulation of proinflammatory material in the mucosa in H. pylori gastritis. Because TNF-α has been shown to inhibit macrophage clearance of apoptotic cells (30), we measured TNF-α secretion of monocyte-derived macrophages incubated with H. pylori (MOI = 10) for 6 h and tested whether the released TNF-α could inhibit macrophage phagocytosis of apoptotic gastric epithelial cells. Indeed, H. pylori–stimulated macrophages released significant amounts of TNF-α (>6000 pg/ml; n = 4; P = 0.01) (Fig. 5A). The in vivo relevance of this finding is reflected in the >4-fold increase in TNF-α mRNA expression in the gastric tissue of H. pylori–infected subjects compared with that of uninfected subjects (Fig. 5B; n = 8; P = 0.013), confirming our previous observation (31). Moreover, pretreatment of macrophages with rhTNF-α (10 ng/ml) caused a significant reduction in macrophage engulfment of AECs (26.8 ± 5.2%, n = 4; p = 0.004) (Fig. 5C), and, conversely, incubation of H. pylori–treated macrophages with a neutralizing anti–TNF-α, but not an isotype control, Ab completely restored the ability of the macrophages to phagocytose AECs (Fig. 5D). In summary, these results implicate TNF-α release by macrophages in response to H. pylori as a potent inhibitor of the cells’ capacity to phagocytose apoptotic gastric epithelial cells. TNF-α mediates reduced apoptotic cell clearance by H. pylori–treated macrophages (MΦ). (A) TNF-α concentrations in culture supernatants of MΦ treated with live H. pylori (MOI = 10) or medium for 6 h were determined by ELISA; n = 4. (B) Human H. pylori infection increases gastric expression of TNF-α. Gastric biopsies obtained from noninfected or H. pylori–infected human subjects were analyzed for TNF-α gene expression by quantitative real-time PCR; n = 8. (C) MΦ pretreatment with rhTNF-α (10 ng/ml) inhibits phagocytosis of AECs. Representative FACS plots (left panels) and cumulative data from four experiments; mean ± SEM (right panel). (D) Neutralization of TNF-α in H. pylori–treated MΦ cultures reverses the suppressive effect of H. pylori on MΦ clearance of AECs. MΦ were pretreated for 6–8 h with both H. pylori and anti–TNF-α Abs (or isotype control) prior to coculture with Hp-AECs Representative FACS plots (top panels) and cumulative data from three experiments; mean ± SEM (bottom panel). To determine whether phagocytosis of apoptotic cells is impaired in human H. pylori gastritis, we analyzed gastric mucosa from H. pylori–infected (n = 9) and noninfected (n = 7) subjects for the presence of HLA-DR+ MNPs and TUNEL+ material, with an average of 954 ± 157 cells analyzed per sample (Fig. 6A–D). As anticipated, H. pylori–infected gastric mucosa contained significantly higher numbers of TUNEL+ cells in the gastric epithelial layer, consistent with H. pylori induction of epithelial cell apoptosis (Fig. 6B). Surprisingly, in contrast to our published digital image analysis study (19), we did not find more HLA-DR+ MNPs in the gastric mucosa of H. pylori–infected versus uninfected subjects (data not shown). This discrepancy could be due to the exclusion of tertiary lymphoid follicle areas, which are rich in DCs but do not allow accurate cell counts, from the current study. The percentage of MNPs containing apoptotic material did not differ significantly between noninfected and H. pylori–infected mucosa, with 2.6 ± 1.4 and 4.7 ± 1.5% of positive cells, respectively (Fig. 6C). Notably, the percentage of MNPs containing TUNEL inclusions in gastric tissue was lower than that seen in isolated cells on cytospins (Fig. 1B), possibly reflecting additional apoptotic cell uptake by the MNPs during the collagenase digestion procedure. Importantly, the amount of TUNEL+ apoptotic material not associated with HLA-DR+ MNPs was significantly increased in H. pylori–infected compared with noninfected tissue. (Fig. 6D). Thus, results of the HLA-DR/TUNEL analysis of gastric tissue support the hypothesis that chronic H. pylori gastritis is associated with insufficient apoptotic cell clearance in the human gastric mucosa. Increased epithelial cell apoptosis and decreased apoptotic cell clearance in H. pylori–infected human gastric mucosa. Paraffin-embedded gastric tissue from seven noninfected and nine H. pylori–infected human subjects was quantitatively analyzed for HLA-DR+ MNPs, TUNEL+ apoptotic cells/cell fragments, and DAPI+ nuclei. (A) Gastric mucosa of an H. pylori–infected subject. Arrows: HLA-DR-Cy3+ (red) MNPs containing TUNEL-FITC+ (green) apoptotic material; arrowheads: nonphagocytosed TUNEL+ apoptotic material. Note that some glandular epithelial cells express HLA-DR. Original magnification ×400. (B) Frequency of TUNEL+ cells in gastric epithelial layer relative to total lamina propria cells. (C) Percentage of HLA-DR+ MNPs containing TUNEL+ material. (D) Free TUNEL+ material not associated with HLA-DR+ MNPs in gastric lamina propria relative to total lamina propria cells. Mean (bars) and individual values (diamonds) are shown. Star: patient #3, outlier, excluded from analysis (value >3 SD from mean); Student t test. Chronic H. pylori gastritis is associated with self-perpetuating inflammation that contributes to the development of autoimmune atrophic gastritis and gastric adenocarcinoma and may persist even after clearance of the bacteria in advanced disease (32, 33). The mechanism for this chronic and persistent inflammation is not fully understood. In this study, we present findings that support inefficient clearance of AECs by gastric MNPs as a pathogenic mechanism in chronic H. pylori gastritis. Increased gastric epithelial cell apoptosis is well established in H. pylori infection and is thought to contribute to gastric carcinogenesis (1). In this regard, our results show that primary human gastric epithelial cells cultured in vitro are highly susceptible to H. pylori–induced cell death. Epithelial cell apoptosis was significantly associated with H. pylori expression of the virulence factor VacA, which causes loss of mitochondrial membrane potential through formation of an anion channel in the inner mitochondrial membrane, thereby inducing apoptosis through the intrinsic pathway (26). The increased epithelial cell death in H. pylori–infected gastric mucosa results in a higher demand for AEC removal. In addition, chronic active H. pylori gastritis also involves infiltration of the gastric mucosa with short-lived neutrophils and lymphocytes (32), further increasing the need for apoptotic cell clearance. In this study, we show that AEC-derived material was present in a proportion of HLA-DRhigh cells in human gastric mucosa, indicating that gastric MNPs are routinely involved in the clearance of apoptotic gastric epithelial cells. In our previous studies, we identified MNPs with high expression of HLA-DR in human gastric mucosa and showed that these cells express variable levels of CD11c, DC-specific ICAM-3–grabbing nonintegrin, CD206, CD14, and CD86 (19, 20). Based on their high HLA-DR expression and ability to drive Th1 T cells in response to H. pylori, we classified those cells as DCs, although some cells may have more macrophage-like characteristics. Within the gastric mucosa, the HLA-DRhigh MNPs are present in the epithelial layer and in the lamina propria, where they are ideally positioned for AEC clearance (19). In agreement with previous reports, we show that the number of AECs was higher in H. pylori–infected samples (1). However, the percentage of MNPs that had phagocytosed apoptotic material was not significantly changed, consistent with a reduced capacity by MNPs in H. pylori–infected mucosa to clear apoptotic cells. Importantly, the amount of apoptotic material not phagocytosed by MNPs was increased in H. pylori infection, supporting our hypothesis of an apoptotic cell clearance defect in chronic H. pylori gastritis. Under steady-state conditions, the uptake of AECs by MNPs contributes to tissue homeostasis by preventing the release of proinflammatory signals that occurs when the dying cell undergoes secondary necrosis (12) and by releasing the anti-inflammatory mediators TGF-β and PGE2 (10). Our data indicate that H. pylori infection suppresses MNP clearance of apoptotic gastric epithelial cells through a TNF-α–dependent mechanism. H. pylori reduced the ability of MNPs to clear apoptotic cells by ∼40%, similar to the level of reduced macrophage clearance of apoptotic cells in SLE (34, 35). Insufficient apoptotic cell clearance is widely recognized as a key disease mechanism in SLE (13) and chronic inflammatory diseases such as atherosclerosis (36), chronic obstructive pulmonary disease (37), and cystic fibrosis (38). Reduced clearance of AECs in the H. pylori–infected human gastric mucosa could exacerbate chronic gastritis by three putative mechanisms. First, nonphagocytosed apoptotic cells that undergo secondary necrosis in the gastric mucosa could release proinflammatory intracellular molecules including nucleic acids, which promote innate immune cell activation (39). This likely results in additional release of proinflammatory cytokines, including TNF-α, by MNPs, which may further inhibit apoptotic cell clearance. Second, epithelial cell autoantigens released from necrotic cells may induce gastric autoimmune responses. In this connection, gastric autoimmunity has been closely associated with H. pylori infection, and ∼50% of H. pylori–infected subjects possess autoantibodies to gastric epithelial cell Ags (40). Conversely, most persons diagnosed with autoimmune gastritis show signs of active or past H. pylori infection (41). A third potential consequence of reduced phagocytosis of AECs in H. pylori infection is decreased tolerization due to reduced APC engulfment of apoptotic cells that contain H. pylori Ags, leading to enhanced inflammatory responses. Our results indicate that H. pylori–induced macrophage release of TNF-α suppressed apoptotic gastric epithelial cell clearance in an auto- and paracrine manner. Thus, our results extend previous reports that TNF-α inhibits macrophage clearance of apoptotic neutrophils (30, 42). TNF-α levels in gastric tissue of H. pylori–infected subjects were increased compared with noninfected subjects, confirming our previous finding (31), and macrophages treated with H. pylori released significant amounts of TNF-α. A number of different pathways for the induction of TNF-α by H. pylori have been described to date. H. pylori TNF-α–inducing protein (43) and protein HP986 (44), both of which signal through NF-κB, have been shown to induce TNF-α secretion directly. In addition, bacterial danger signals that trigger MyD88 signaling through activation of TLRs are involved in the induction of TNF-α and other proinflammatory cytokines in response to H. pylori stimulation (45). Notably, phagocytosis of H. pylori is required for maximal stimulation of TNF-α secretion (46). Although H. pylori bacteria have been identified in the gastric lamina propria, often in close contact with MNPs (27), direct contact between these cells and H. pylori, resulting in autocrine TNF-α signals, is likely infrequent. However, the majority of gastric MNPs in the H. pylori–infected gastric mucosa will be exposed to paracrine TNF-α signals, which may derive from both MNPs and H. pylori–reactive Th1 cells (47). Notably, the suppressed phagocytosis by H. pylori–treated macrophages was not specific to the uptake of AECs, because macrophage uptake of latex beads and of H. pylori bacteria also was reduced, corroborating previous observations that H. pylori can inhibit its own uptake by macrophages (29). In conclusion, we propose that an increased apoptotic cell load in the H. pylori–infected human gastric mucosa exacerbates the persistent inflammatory state that leads to gastric atrophy and adenocarcinoma through a mechanism in which H. pylori–induced MNP secretion of TNF-α suppresses apoptotic cell clearance. The observed insufficient apoptotic cell clearance in the gastric mucosa may then result in a release of inflammatory components and autoantigens from the dying cells, which further enhances gastric inflammation, independent of H. pylori bacteria. We thank Donna Crabb and Amy Ratliff for preparation of H. pylori cultures. We also thank the Analytic and Preparative Cytometry Facility, the Digestive Diseases Research Development Center Human Cell/Tissue Core Human Cell/Tissue Core, and the University of Alabama at Birmingham High Resolution Imaging Facility for supporting this study. This work was supported by National Institutes of Health Grants DK-54495 (to P.D.S. ), AI-079145 and AI-07047 (to P.B.E. ), DK-084063 (to P.B.E. and P.D.S. ), AI-083539 (to L.E.S. ), DK-097144 (to D.B. ), RR-20136, and DK-064400, the Mucosal HIV and Immunobiology Center (to P.D.S. and L.E.S. ), the University of Alabama at Birmingham (UAB) Autoimmunity, Immunology and Transplantation Steering Committee Pilot Program (to D.B. ), UAB Center for Clinical and Translational Science Pilot Program Grant UL1 TR000165 (to D.B. ), Fondo Nacional de Desarrollo Científico y Tecnológico Grant 1130387 (P.R.H. ), and the Research Service of the Veterans Administration (P.D.S.). Support was also provided by the Analytic and Preparative Cytometry Facility (Grant P30 AR48311), the Digestive Diseases Research Development Center Human Cell/Tissue Core (Grant DK-64400), and the UAB High Resolution Imaging Facility.
. 2001. Apoptosis in gastric epithelium induced by Helicobacter pylori infection: implications in gastric carcinogenesis. Am. J. Gastroenterol. 96: 16–26.
. 2007. Helicobacter pylori infection induces oxidative stress and programmed cell death in human gastric epithelial cells. Infect. Immun. 75: 4030–4039.
. 1999. Helicobacter pylori induces gastric epithelial cell apoptosis in association with increased Fas receptor expression. Infect. Immun. 67: 4237–4242. 2003. Induction of gastric epithelial cell apoptosis by Helicobacter pylori vacuolating cytotoxin. Cancer Res. 63: 951–957.
. 2011. Helicobacter pylori vacuolating cytotoxin A (VacA) engages the mitochondrial fission machinery to induce host cell death. Proc. Natl. Acad. Sci. USA 108: 16032–16037.
. 2000. Helicobacter pylori urease binds to class II MHC on gastric epithelial cells and induces their apoptosis. J. Immunol. 165: 1918–1924. 2009. Apoptosis and cancer: the genesis of a research field. Nat. Rev. Cancer 9: 501–507.
. 2009. Innate immune recognition of infected apoptotic cells directs T(H)17 cell differentiation. Nature 458: 78–82.
. 2010. Helicobacter pylori-induced Th17 responses modulate Th1 cell responses, benefit bacterial growth, and contribute to pathology in mice. J. Immunol. 184: 5121–5129.
. 1998. Macrophages that have ingested apoptotic cells in vitro inhibit proinflammatory cytokine production through autocrine/paracrine mechanisms involving TGF-β, PGE2, and PAF. J. Clin. Invest. 101: 890–898.
. 2012. Programmed cell removal: a new obstacle in the road to developing cancer. Nat. Rev. Cancer 12: 58–67. 2011. Beginnings of a good apoptotic meal: the find-me and eat-me signaling pathways. Immunity 35: 445–455.
. 2011. Disturbances of apoptotic cell clearance in systemic lupus erythematosus. Arthritis Res. Ther. 13: 202.
. 2000. A discrete subpopulation of dendritic cells transports apoptotic intestinal epithelial cells to T cell areas of mesenteric lymph nodes. J. Exp. Med. 191: 435–444.
. 1999. The fate of epithelial cells in the human large intestine. Pathology 31: 230–238.
. 1999. Epithelial integrity, cell death and cell loss in mammalian small intestine. Histol. Histopathol. 14: 257–267.
. 1993. A novel mechanism for disposing of effete epithelial cells in the small intestine of guinea pigs. Gastroenterology 105: 1089–1097.
. 1993. Species-differences in the process of apoptosis in epithelial cells of the small intestine: an ultrastructural and cytochemical study of luminal cell elements. Arch. Histol. Cytol. 56: 83–90.
. 2010. Human primary gastric dendritic cells induce a Th1 response to H. pylori. Mucosal Immunol. 3: 260–269.
. 2011. Stromal regulation of human gastric dendritic cells restricts the Th1 response to Helicobacter pylori. Gastroenterology 141: 929–938.
. 2000. A method for establishing primary cultures of human gastric epithelial cells. Methods Cell Sci. 22: 133–136.
. 2008. A decade of tissue microarrays: progress in the discovery and validation of cancer biomarkers. J. Clin. Oncol. 26: 5630–5637.
. 2011. Brain angiogenesis inhibitor 1 (BAI1) is a pattern recognition receptor that mediates macrophage binding and engulfment of Gram-negative bacteria. Proc. Natl. Acad. Sci. USA 108: 2136–2141.
. 2007. BAI1 is an engulfment receptor for apoptotic cells upstream of the ELMO/Dock180/Rac module. Nature 450: 430–434. 2001. A new mathematical model for relative quantification in real-time RT-PCR. Nucleic Acids Res. 29: e45.
. 2012. Helicobacter pylori VacA: a new perspective on an invasive chloride channel. Microbes Infect. 14: 1026–1033.
. 2007. Intracellular, intercellular, and stromal invasion of gastric mucosa, preneoplastic lesions, and cancer by Helicobacter pylori. Gastroenterology 132: 1009–1023.
. 1992. Surface proteins from Helicobacter pylori exhibit chemotactic activity for human leukocytes and are present in gastric mucosa. J. Exp. Med. 175: 517–525.
. 2001. Helicobacter pylori resists phagocytosis by macrophages: quantitative assessment by confocal microscopy and fluorescence-activated cell sorting. Infect. Immun. 69: 2604–2611.
. 2007. TNF-α inhibits macrophage clearance of apoptotic cells via cytosolic phospholipase A2 and oxidant-dependent mechanisms. J. Immunol. 178: 8117–8126.
. 2002. Cytokine gene profile in gastric mucosa in Helicobacter pylori infection and Zollinger-Ellison syndrome. Am. J. Gastroenterol. 97: 312–318.
. 2007. Immunology of Helicobacter pylori: insights into the failure of the immune response and perspectives on vaccine studies. Gastroenterology 133: 288–308.
. 2009. Helicobacter pylori infection and chronic atrophic gastritis: associations according to severity of disease. Epidemiology 20: 569–574.
. 2006. Macrophages from patients with SLE and rheumatoid arthritis have defective adhesion in vitro, while only SLE macrophages have impaired uptake of apoptotic cells. Ann. Rheum. Dis. 65: 216–221.
. 1998. 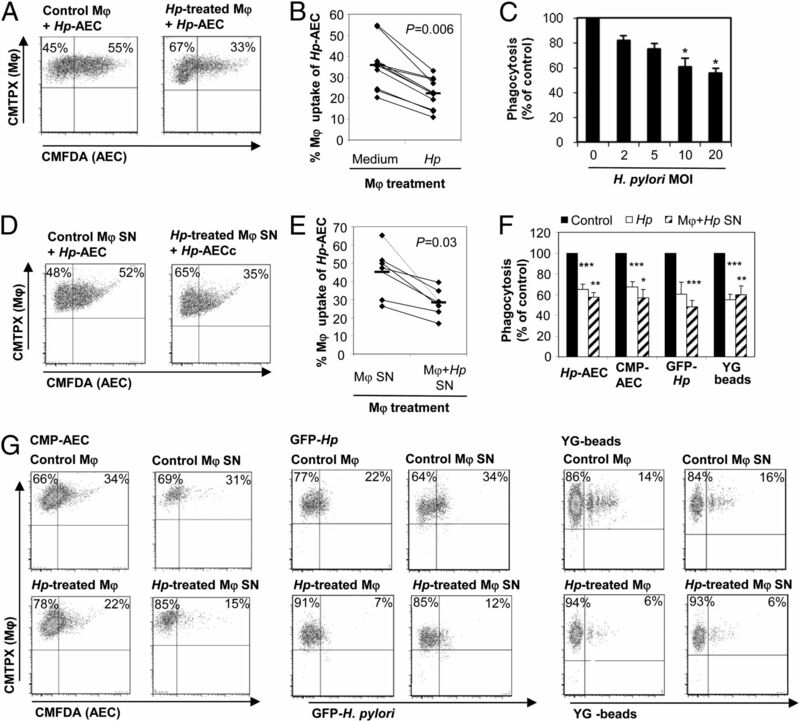 Impaired phagocytosis of apoptotic cell material by monocyte-derived macrophages from patients with systemic lupus erythematosus. Arthritis Rheum. 41: 1241–1250.
. 2005. Phagocytosis of apoptotic cells by macrophages is impaired in atherosclerosis. Arterioscler. Thromb. Vasc. Biol. 25: 1256–1261.
. 2003. Alveolar macrophages from subjects with chronic obstructive pulmonary disease are deficient in their ability to phagocytose apoptotic airway epithelial cells. Immunol. Cell Biol. 81: 289–296.
. 2002. Elastase-mediated phosphatidylserine receptor cleavage impairs apoptotic cell clearance in cystic fibrosis and bronchiectasis. J. Clin. Invest. 109: 661–670.
. 2010. Clearance of apoptotic cells: implications in health and disease. J. Cell Biol. 189: 1059–1070.
. 1997. Antigastric autoantibodies in Helicobacter pylori infection: implications of histological and clinical parameters of gastritis. Gut 41: 619–623.
. 2003. Molecular mimicry between Helicobacter pylori antigens and H+, K+ —adenosine triphosphatase in human gastric autoimmunity. J. Exp. Med. 198: 1147–1156.
. 2011. Lipopolysaccharide inhibits macrophage phagocytosis of apoptotic neutrophils by regulating the production of tumour necrosis factor α and growth arrest-specific gene 6. Immunology 132: 287–295.
. 2013. Helicobacter pylori tumor necrosis factor-α inducing protein promotes cytokine expression via nuclear factor-κB. World J. Gastroenterol. 19: 399–403.
. 2011. Concurrent proinflammatory and apoptotic activity of a Helicobacter pylori protein (HP986) points to its role in chronic persistence. PLoS ONE 6: e22530.
. 2007. Toll-like receptor-dependent activation of antigen-presenting cells affects adaptive immunity to Helicobacter pylori. Gastroenterology 133: 150–163, e3.
. 2005. Impact of Helicobacter pylori virulence factors and compounds on activation and maturation of human dendritic cells. Infect. Immun. 73: 4180–4189.
. 2009. 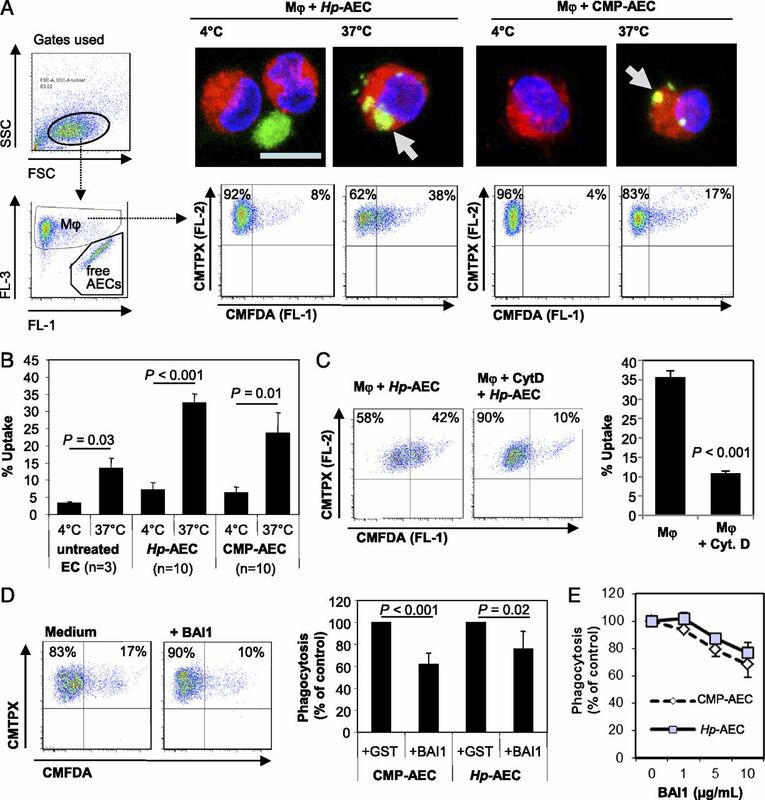 A2A adenosine receptor (AR) activation inhibits pro-inflammatory cytokine production by human CD4+ helper T cells and regulates Helicobacter-induced gastritis and bacterial persistence. Mucosal Immunol. 2: 232–242.